Lang fan clutch wrench service kit removes and installs the fan clutch thermostatic fan assembly on many models when repairing or replacing the water pump, timing chain, or the fan clutch. Use Lang fan Clutch wrenches with 1/2'' square drive tools and a torque wrench. 3422 40mm Fan Clutch Wrench removes thermostatic fan assembly on 1993-current 4.9L Ford engines. Lang Ford Fan Clutch Wrench Set. Remove and install the fan clutch thermostatic fan assembly on many models when repairing or replacing the water pump, timing chain, or the fan clutch. Includes part numbers 3136-36 and 3136-58. Lang Ford Diesel Fan Clutch Wrench Set. Remove and install the fan clutch thermostatic fan assembly on many models when repairing or replacing water pump, timing chain, or the fan clutch. Includes part numbers 3296-83 and 3474. Lang Fan Clutch Wrench Set. Remove and install the fan clutch thermostatic fan assembly on many models when repairing or replacing the water pump, timing chain, or the fan clutch. Includes part numbers 3136-36, 3422, and 3900. Lang Small Pulley Holder Pin Set. Remove and install the fan clutch thermostatic fan assembly on many models when repairing or replacing the water pump, timing chain, or the fan clutch. Contains two pins: 5mm by 8mm. Lang Large Pulley Holder Pin Set. Remove and install the fan clutch thermostatic fan assembly on many models when repairing or replacing the water pump, timing chain, or the fan clutch. Contains 4 pins: two 6mm by 10mm, and two 7.5mm by 18mm. Lang Fan Clutch Wrench Service Kit. Remove and install the fan clutch thermostatic fan assembly on many models when repairing or replacing the water pump, timing chain, or the fan clutch. Includes part numbers 3136-36, 3422, 3473, 3900, 3903, and 3904. The 41570 Lang Fan Clutch Wrench Service Kit is one of thousands of quality tooling products available from MRO Tools. 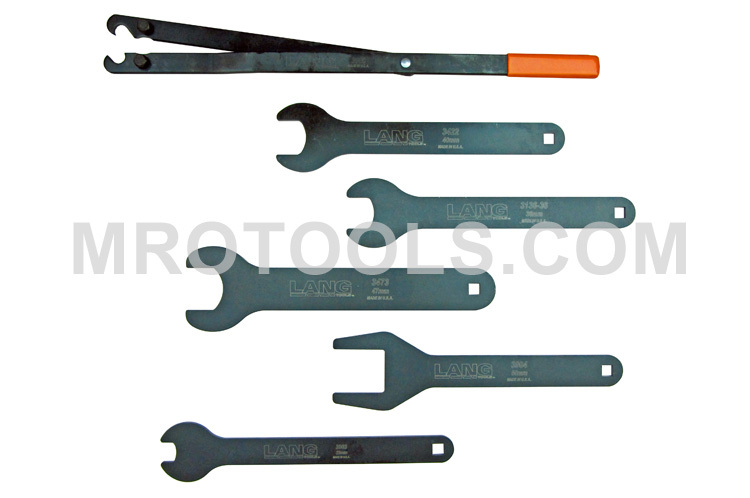 Please browse Lang Fan Clutch Wrenches for tools similar to the 41570 Lang Fan Clutch Wrench Service Kit. 41570 Lang Fan Clutch Wrench Service Kit description summary: Lang Fan Clutch Wrench Service Kit. Remove and install the fan clutch thermostatic fan assembly on many models when repairing or replacing the water pump, timing chain, or the fan clutch. Includes part numbers 3136-36, 3422, 3473, 3900, 3903, and 3904. Quantity discounts may be available for the 41570 Lang Fan Clutch Wrench Service Kit. Please contact MRO Tools for details.